RCIA (Right of Christian Initiation for Adults) is the process through which adults are fully introduced to the Roman Catholic Faith and way of life. It is during the Easter Vigil that RCIA candidates, with the support of their sponsors, join and become accepted members of the Roman Catholic Faith. 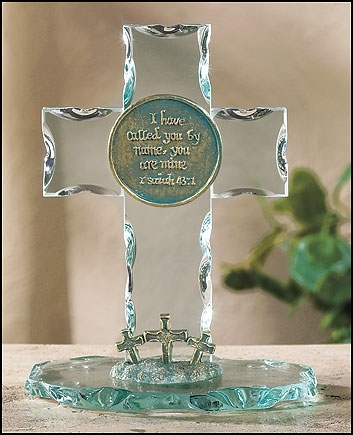 Our RCIA Glass Cross Stand makes a perfect gift for any RCIA candidate. The base of the stand has three small crosses and the center cross medallion is inscribed with the following verse: “I have called you by name; you are Mine” Isaiah 43:1. It will be a thoughtful reminder and cherished token of their faith filled journey.